Minor aortopulmonary collaterals (APCAs) are one of the major complications of hypoxia, especially in patients before and after the Glenn procedure. It is common to occlude minor APCAs by coils or other devices before Glenn and Fontan operations because their blood flow may cause volume-overload heart failure and disturb venous return and pulmonary blood flow in Glenn and Fontan Circulation.1) However, the histology of minor APCA remains unknown, because its structure has not been reported previously. A 2-year-old girl, with a history of complete atrioventricular septal defect with hypo LV that was palliated with Glenn procedure, underwent transcatheter coil embolization of minor APCAs before the Fontan operation. Her SpO2 was 75% at room air. About 5 mm length of a minor APCA branching from her right subclavian artery was obtained in the catheter session. Thus, the histology of the specimen was investigated. 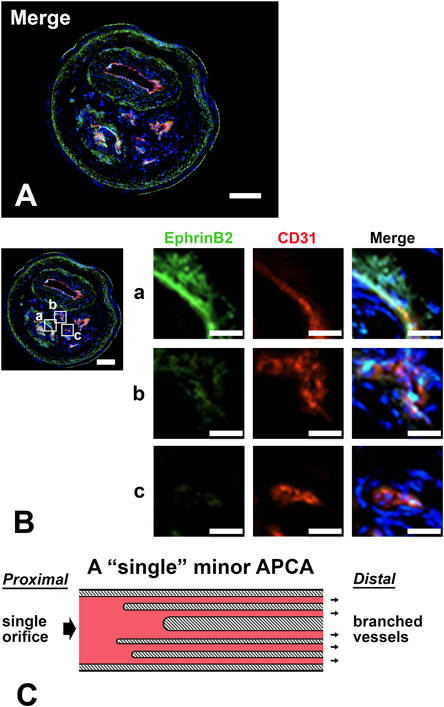 Interestingly, a cross section of the specimen showed that the single minor APCA was composed of two small arteries, four capillaries, and an unclassified vessel, assessed by hematoxylin-eosin staining and immunohistochemistry using CD31 (vascular endothelial marker), EphB4 (venous endothelial marker), and Ephrin B2 (artery and capillary endothelial marker) antibodies (Fig. 1A–D; Fig. 2A, B). In addition, these vessels were embedded in supporting tissue surrounded by a capsule-like outer-membrane which was positively stained with Ephrin B2 (Fig. 2A, B). 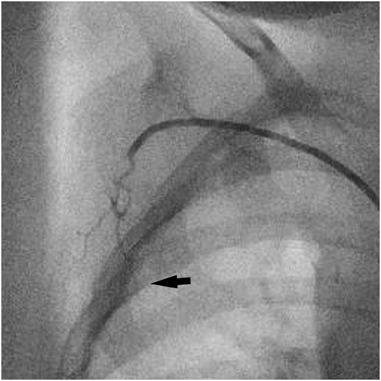 These results indicated that several types of vessels branched from a single minor APCA in its peripheral site even though it appeared to be a single vessel lumen on angiography (Fig. 2C). A) Hematoxylin and eosin staining. B) Vascular endothelial cells were positively stained with CD31 antibody (red). C) Ephrin B2 (green) was expressed in most of the CD31 positive cells. D) None of the CD31 positive cell expressed EphB4, indicating that no venous vasculature was included in the minor APCA. Bar; 100 µm. Fig. 2 Several types of vessels branching from a “single” minor APCA. A) Merged image of a cross section of minor APCA stained by CD31 (red), Ephrin B2 (green), and Hoechst33342 (blue). B) The left upper panel is the same image as (A). Bar; 100 µm. 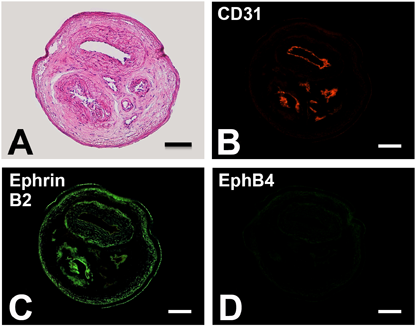 (a) An artery expressing CD31 and Ephrin B2 strongly. (b) A capillary expressing CD31 strongly and Ephrin B2 weakly. (c) A vessel expressed CD31 but not EphB4 nor Ephrin B2, which could not be classified to specific type of vessels. Nuclei were stained with Hoechst33342. Bar; 25 µm. C) A schematic figure of minor APCA. We sometimes require many coils for occluding a minor APCA completely despite its size. Considering this unique structure, occlusion of the proximal side of a minor APCA, especially its orifice, is important for complete occlusion. Supplementary are provided online for this article.